Today we pay tribute to a spice that’s bold in color and potent in power. It’s well-known for reducing inflammation, supporting the liver, and helping with cancer prevention. You’ve likely seen turmeric appearing more at your local health food store. Turmeric teas, smoothie powders, elixirs, golden milks and more. This gnarly little orange root is all the rage these days and for very good reason! Turmeric is likely best known for its anti-inflammatory and anti-oxidant properties. In India, turmeric has been used extensively in Ayurvedic healing practices for centuries, especially to quell the fires of inflammation. Their love of turmeric for taste and medicinal properties is evident as it’s the spice that gives the ever-present Indian curry powder its brilliant yellowish-orange hue. This potent anti-inflammatory property makes it a good choice for addressing most acute, chronic, or silent inflammatory conditions—from carpal tunnel, to arthritis, to heart disease. Turmeric powder can even be made into a paste, combined with water, to be used topically on cuts, canker sores and cold sores. In addition to addressing inflammation, turmeric has been used for centuries to combat indigestion and stomach irritation, and to enhance digestion. Pair it up with our favorite spice from this post (that’s ginger!) for a tonic that’s sure to ease all sorts of digestive woes. Turmeric also tones the liver and gallbladder—making it a perfect spice to support your detoxification endeavors. The spice increases production of the enzymes needed to digest fat and sugar, and helps to stop the the crystallization of cholesterol that can result in gallstones. Turmeric has been found to be very effective in promoting the death of cancer cells present in a variety of tissues within the body, particularly in the colon. And it deactivates the immune cells that cause inflammation without negatively affecting other parts of the immune system needed to fight disease and infection. It really is high time we pay tribute to turmeric! 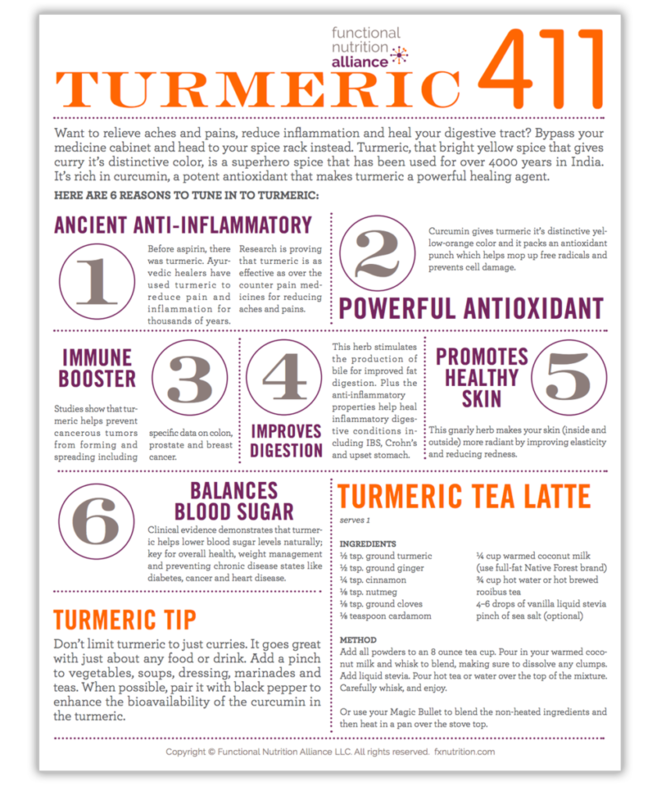 For more turmeric testimonials and teasers, travel over to our Turmeric 411 handout. Print it and pin it on your fridge to remind yourself to shake that yellow spice on most of your meals—even your morning smoothie will work well with a turmeric addition! You’ll also see my go-to turmeric recipes, a spicy tea latte that’s perfect for these cold winter days. And if you’re lucky enough to find fresh turmeric at the market (look for it near the fresh ginger), grab that gnarly root and start adding it to your afternoon elixirs for a daily dose of anti-inflammatory power.